These Flexible Cutting Mats Work Like a Charm! Especially due to the fact that they have pictures Stenciled on them for what each mat is designed for. These handy kitchen accessories are made in the U.S.A., using FDA approved virgin food grade plastic and inks. They feature Microban protection that inhibits the growth of stain and odor-causing bacteria. Best of all, these gems are perfect for your kitchen! 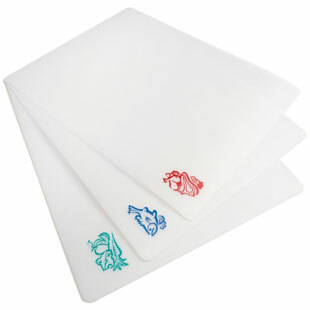 They are durable and pliable - great for transferring chopped items from the mat to the bowl, pot or pan! Plenty of room too - 11.5" x 15" - for prepping all of your meats, fruits, and vegetables. Plus no cross-contamination as each is cleverly designed with its own picture. Proper cutting boards for your culinary practice; that's an understatement! These Flexible Cutting Mats are perfect for your RV, Boat, and Home! They are simple, convenient and easy to use - no messy cleanup - no mess - no stress! Each stenciled with FDA approved, food-grade ink to avoid cross-contamination and are made from flexible FDA approved, food-grade plastic to conveniently transfer your chopped delights to your bowl, pot or pan!